Justin Jordan (SPREAD, LUTHER STRODE) and Tradd Moore (LUTHER STRODE, All New Ghost Rider) reunite for LEGACY OF LUTHER STRODE, the final chapter in the popular LUTHER STRODE trilogy, set to launch from Image Comics on April 1. For five years, Luther Strode and Petra have been on the run. Now the time for running is over, and the Murder Cult is going down. The road to Cain starts here in the double-sized debut of LEGACY OF LUTHER STRODE #1. Readers first met Luther Strode in THE STRANGE TALENT OF LUTHER STRODE. Just an average nerd, Luther Strode sends away for a bodybuilding course from an old comic book—one that ends up working a lot better than he ever imagined. Though his newfound strength and strange talents make school a lot easier, they've also caused some very, very bad people to take a very, very keen interest in him. In the follow-up, THE LEGEND OF LUTHER STRODE, Luther became more than a nightmare for the evil men in his city... he became a legend. He found himself hunted by a legendary killer and ended up with a measure of redemption and a new mission in life: stop the people that made him what he is. 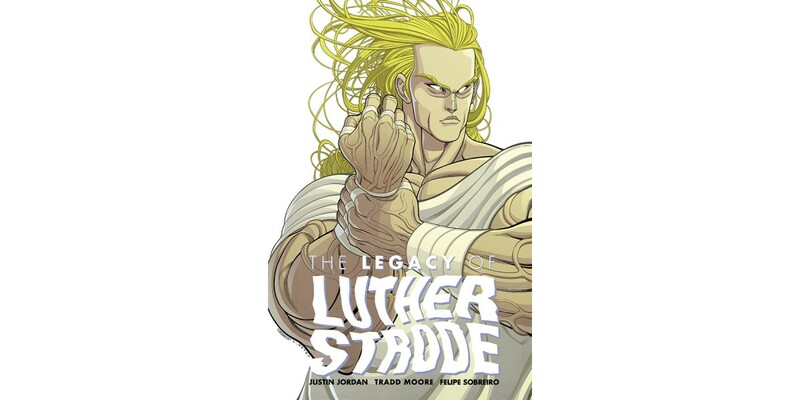 LEGACY OF LUTHER STRODE takes Petra and Luther across the world, from Russia to Hong Kong to some place east of Eden, hunting for the man who started all of this: Cain himself. The story ends here. The double-sized LEGACY OF LUTHER STRODE #1 will land in stores on April 1 and can be pre-ordered using Diamond Code FEB150498.